Over 300 study resolutions were proposed in the legislative session. Listed below are study resolutions Disability Rights Nebraska will be monitoring and providing input as requested or needed. * Disability Rights Nebraska approached Senator Kolowski about proposing a study resolution on the use of restraint and seclusion in Nebraska schools. 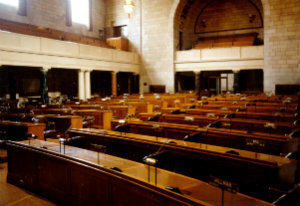 Disability Rights Nebraska offered model language for this resolution and Senator Kolowski agreed to introduce a study resolution on this issue—LR 314. Disability Rights Nebraska’s public policy staff have been working with Senators Kolowski and Coash on their respective restraint/seclusion resolutions (see LR 249 for Senator Coash’s resolution). It looks promising (no guarantees) that these resolutions will have a public hearing and possibly further legislative action during the upcoming session in January 2016. To track interim hearing schedules go to this page of the Nebraska Legislature website. The use of restraint and seclusion in U.S. schools has garnered much attention in recent years. Allegations of severe injury and death of students resulting from the use of restraints and seclusion in schools have been documented in several national studies, and other media reports are widespread. Disability Rights Nebraska has compiled a report on the issue of restraint and seclusion in schools. Current laws in Nebraska do not provide sufficient protection and oversight, despite the widely recognized risks of restraint and seclusion. It's time that changes. READ OUR REPORT.